Personal Organiser Planner Refills 2018. Day, Daily & Weekly Formats. Start your 2018 refill set any month. No more wasted pages, your fresh start to getting orgainsed this year. Our refills come with unrivaled choice and flexibility. 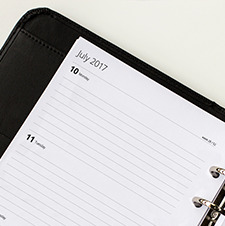 We cover all the major sizes, a host of popular formats, and each product includes our custom start date option. 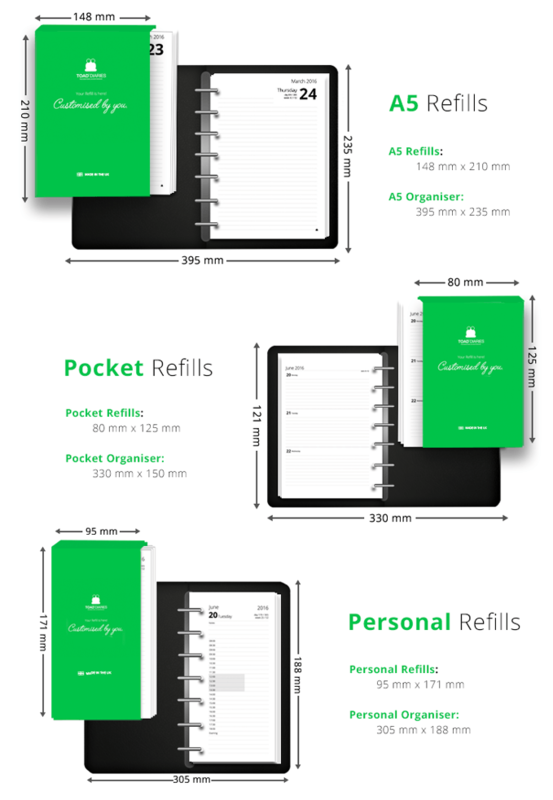 Our refills fit the major brand's sizes and we stock Personal Size, Pocket Size & A5. 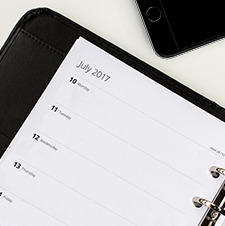 With many options, including the most popular week-to-view and day-per-page formats, you'll be able to find your preferred options here. 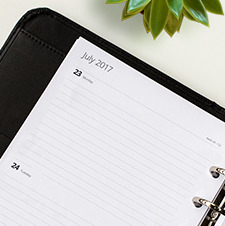 In addition, you'll be able to choose your start month meaning no more wasted pages. 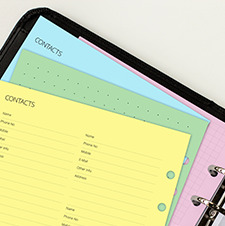 Note: If you are looking for an A5 refill to fit your Collins Organiser you'll need a 7-hole refill. This applies to A5 size only. Other Collins organisers fit the standard punching system. 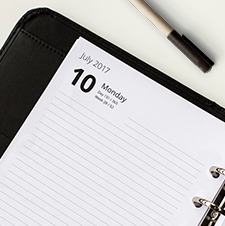 At TOAD® we pride ourselves on creating quality notebooks, diaries, and refills whilst providing exceptional customer service. You'll receive your product within 3 working days. And we have a no quibble money back guarantee; if you’re not 100% happy with your product then you’ll get your money back. That simple. Your refill is environmentally friendly, made right here in the UK, and will be quality-checked so you get the perfect product. All at a competitive price. What more can you ask for? TOAD – One of a kind.